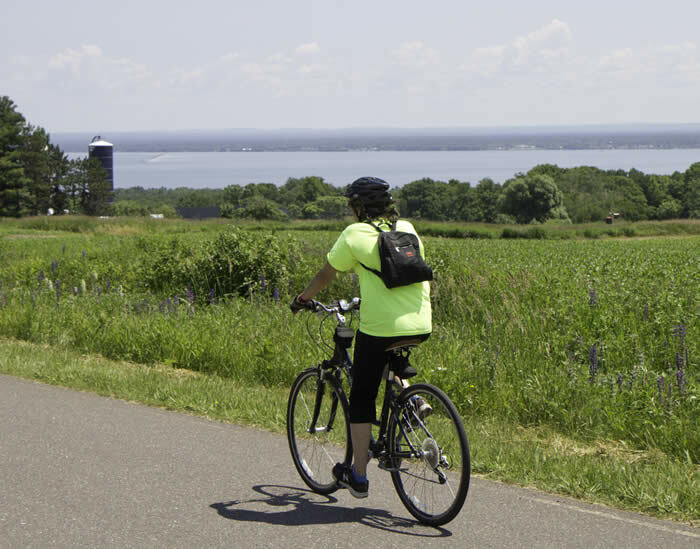 All types of biking are thriving in the Washburn Area and growing in popularity. Road biking dominates the biking scene because of the many superb paved roads around Washburn. 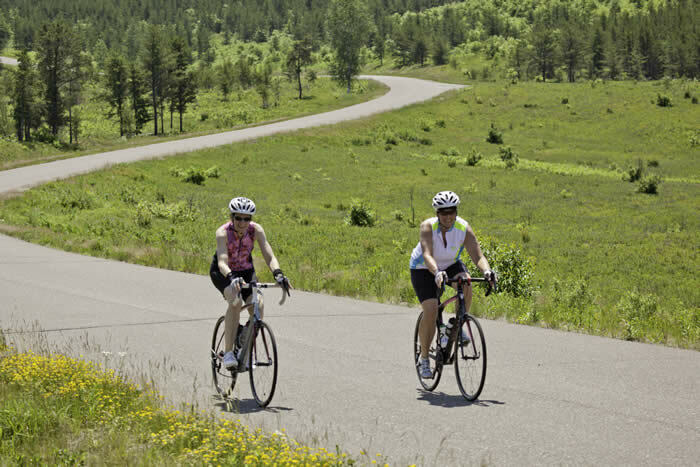 including riding through the famed Moquah Barrens ! If you have small children or just want to “bike around town”, Washburn offers routes within and around the city. One route follows the federally – designated National Historic District on E. 3rd. Street . This is a great way to see the city from a safe and historic perspective as you are also enjoying your bike ride. Maps available at the Washburn Chamber, City Hall, Bayfield County Tourism and selected retail shops. 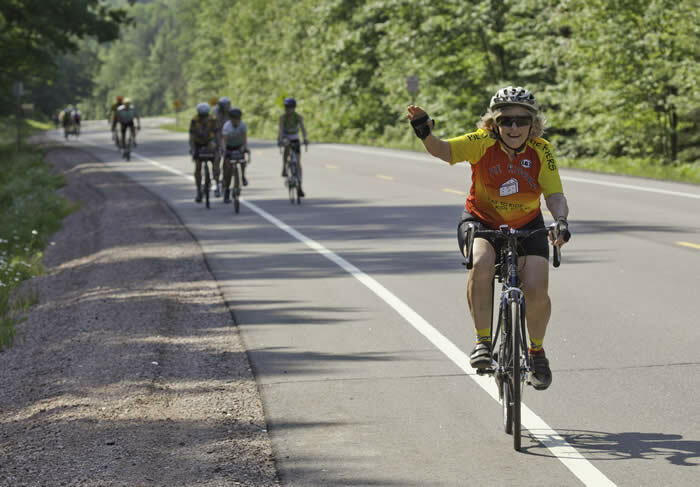 For other routes, including maps, please access the Superior Vistas Bike Tour website at www.superiorvistas.org. This awesome tour is always held the fourth Saturday in June. There are 8 routes : 7 paved routes (13, 19, 34, 40, 52, 70 and 100) and one 10 mile off-road route. All, except the off-road route are publicly accessible all year. The off-road cycling scene has exploded in and around Washburn. Just north of town toward Bayfield, near Mt. 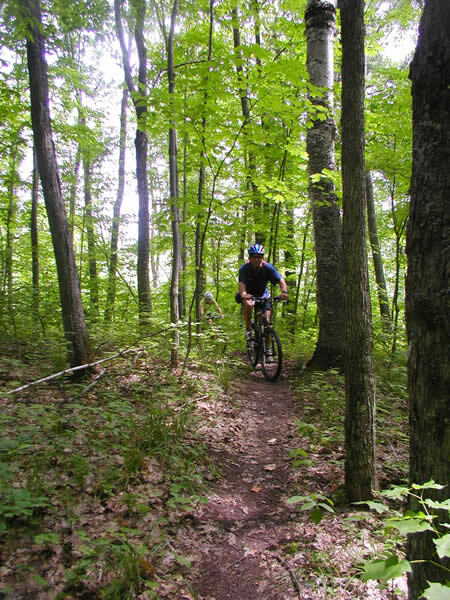 Ashwabay, check out the CAMBA mountain bike trails. Work to expand these trails is ongoing; new trails are continuously being added. Of course , any gravel road in the area is a perfect venue to hop on that 29’er and head out of town for a super spin. 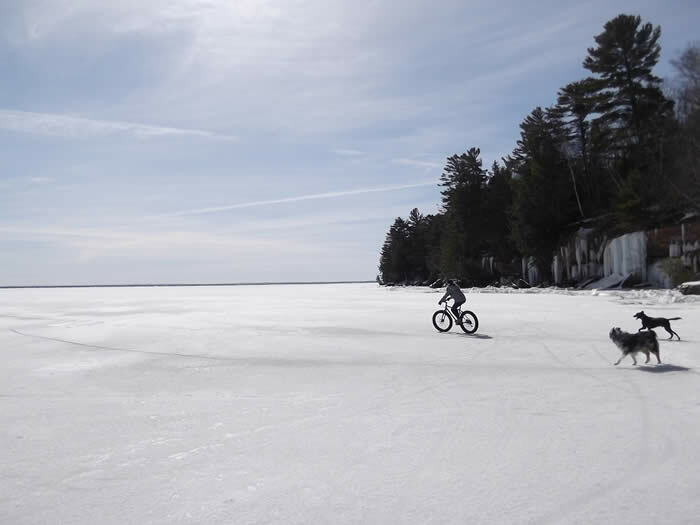 In winter, stud your mountain bike tires and hit the ice on the Big Lake. The traction is amazing and guarantees a safe, enjoyable ride. Another cycling sport that has really taken off in the Washburn area is “fat biking”. 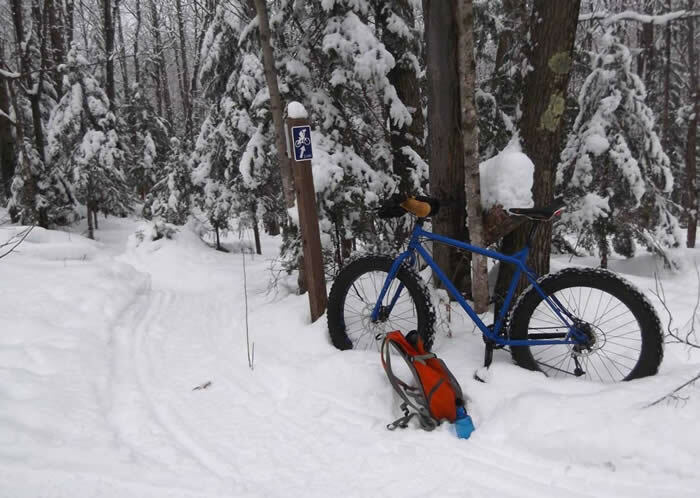 These bikes are prefect to ride through the snow on Lake Superior or the sand ruts in the Chequamegon/ Nicolet National Forest . 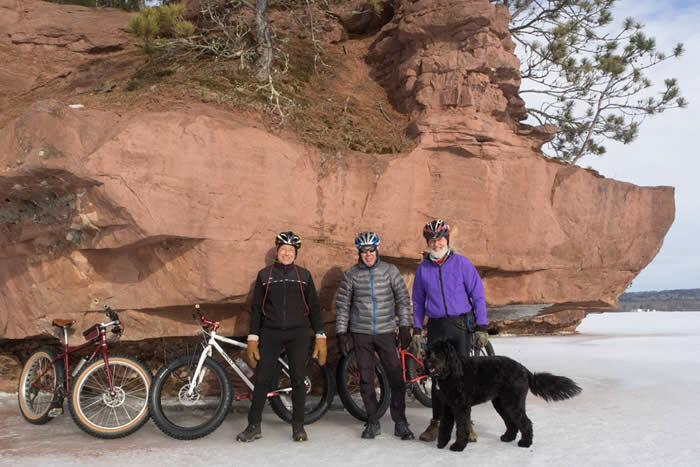 Bike out from Washburn’s front door onto the ice and explore Washburn’s very own ice caves east of town. Or launch from Washburn’s back door going west and ride miles and miles of sandy national forest roads. The wide, low volume fat bike tires will take you anywhere with ease. 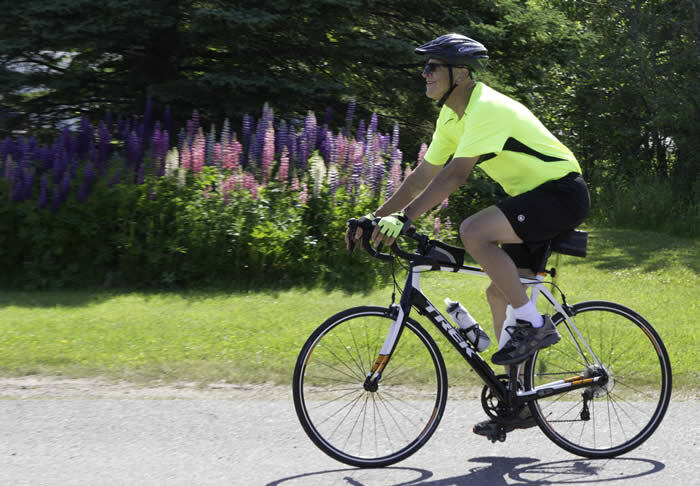 For more specific information about biking in and around Washburn , please contact North Coast Cycling Association (NCCA) at info@northcoastcycling.com or phone (715) 373-2114. Washburn truly is a biking mecca ! Please come and join us for a fantastic cycling experience, on whatever bike you choose to ride. Biking in the winter is growing every year. 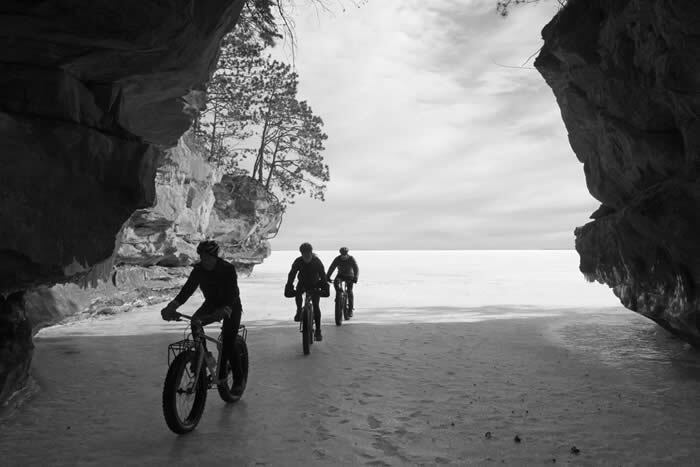 From biking on Lake Superior (including the Bayfield to Madeline Island Ice Road) to the roads in the National Forest and the popular Fat Bike Trails at Mt. Ashwabay. 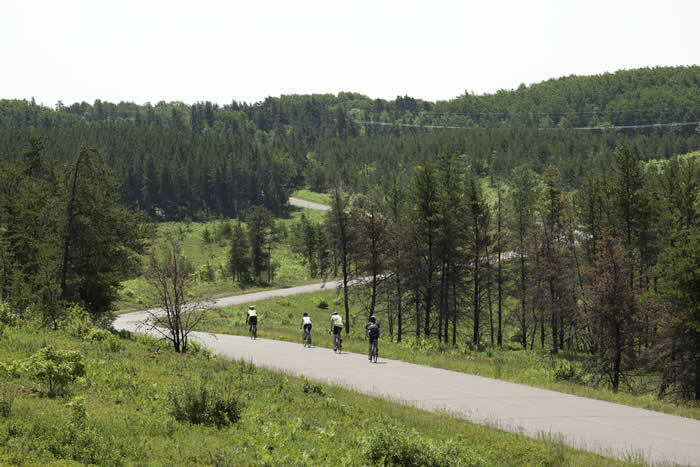 Whether you have a mountain bike, fat bike or sometimes even a road bike there are many places in the area to ride and enjoy some beautiful scenery along with getting some great exercise. 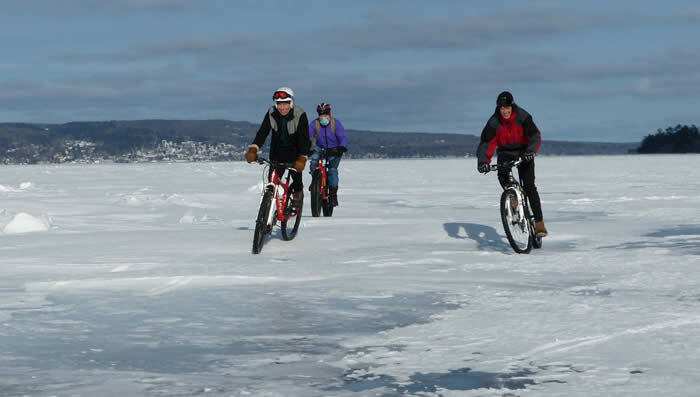 Riding the ice on Lake Superior has been popular for several years. The first ice bikers were the ice fisherman modifying their bikes to pull an ice fishing sled with all their gear. 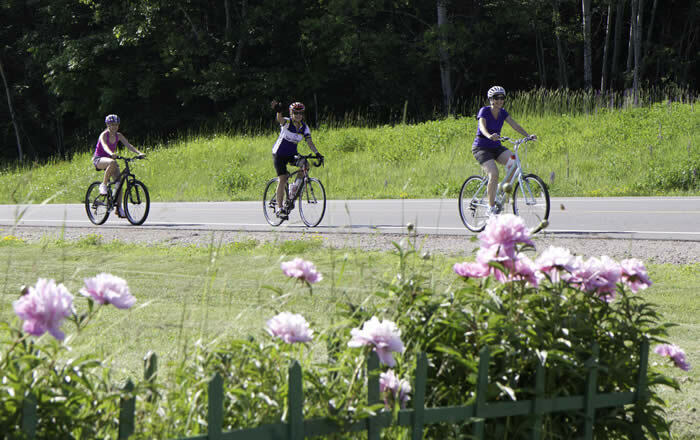 Now many bikers have taken their bikes out to Madeline Island and further. General guidelines regarding ice thickness and safety can be found at http://www.dnr.state.mn.us/safety/ice/thickness.html. 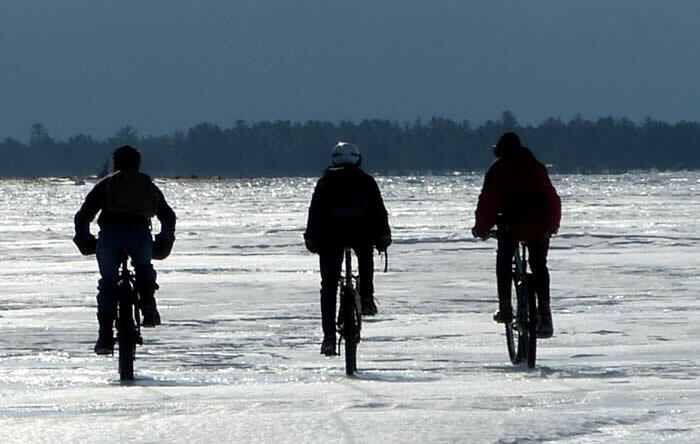 Studded tires are recommended for ice riding. National Forest roads are another great place to ride. A lot of them are plowed through the winter and the others are still ride-able with fat bikes. Great opportunity to connect with nature and track all the wildlife that use the roads for easy passage including the local wolf packs. 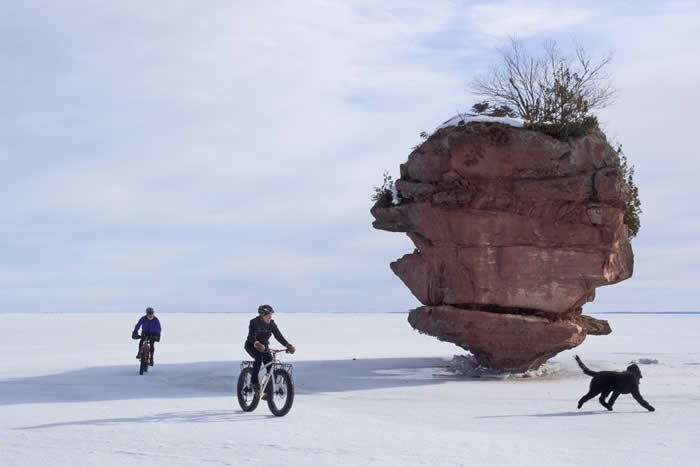 Bayfield’s Mt Ashwabay Ski & Recreation Area has some great fat bike trails that give the rider a great workout and a lot of downhill thrills. You can find more information on the trail system at http://www.mtashwabay.org/winter-fat-tire-biking.html.